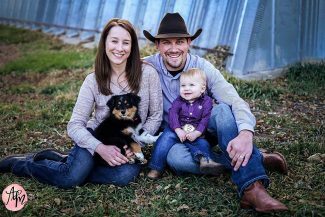 For the last four years, the Nebraska High School Rodeo Association Judge of the Year title has belonged to the White name, but not just one White. Trey White has been awarded the honor in 2014, 2015, and 2017, and his wife, Becky White received the title in 2016, the only female to be voted as such. "It's a huge honor. The high school contestants are who vote on it at state finals, and they award it at their banquet in November," Becky said. "It's a huge honor for both of us." The pair took a judging class when Becky was Miss Rodeo Nebraska; she was encouraged to take the class to round out her résumé. Trey decided to join, and they've been certified judges since 2011. "Becky was going to the judging class for the queen deal, and I knew they were getting low on the numbers of young judges," Trey said. "My dad has been pushing me for years and my brother-in-law was judging at the time. He got me into a couple rodeos and it blossomed from there." 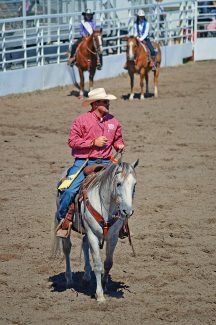 Trey judges all events within junior high and high school rodeos, and Nebraska State Rodeo Association (NSRA) events. Becky judges primarily the female events in junior high and high school rodeos. "When I was first getting started, I went to more rodeos. They were short on female judges, and they push that female judges do the female events," Becky said. "Lately the tides have turned. Last fall I didn't judge at all, it was too much work being pregnant, and I've stayed home with the little one, Colton." While Trey typically judges more rodeos per season than Becky, they can often be seen traveling together with their year-old son. "Since we both started judging, a lot of rodeo committees have picked up on that. It saves them some expenses, one hotel room, that kind of thing. We're fortunate in that area; we do get booked together quite often," Becky said. "I really enjoy bringing the family," Trey said. "Becky and I have always gone together wherever we've gone. Now the little one gets to learn the ropes with us. The rodeo families look forward to seeing him." 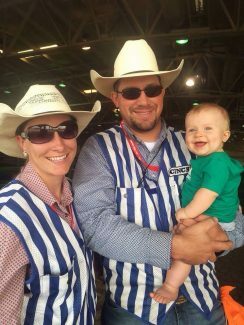 Judging rodeos offers an opportunity for Colton to grow up in rodeo, as Trey and Becky did. Trey joked that he will probably learn all the rules before he even competes in the events. "He travels quite frequently with both of us. If Trey is judging, we go along to watch. If we're both judging, we bring along a grandparent or family friend," Becky said. Both Whites competed in high school rodeo and college rodeo at Chadron State College, Trey in calf roping and team roping and Becky in barrel racing. Trey enjoys sticking to what he knows but is expanding his rough-stock judging knowledge. He's even judged female events a time or two. Becky judges primarily goat tying, pole bending, breakaway roping, and barrel racing. "All of the events have their own perks," Trey said. "The timed events are my favorites; I was a timed events person in high school and college. I like rough stock, but I struggle with it just because I didn't do in college. I'm getting better at it though. The judging season gets rolling for Whites the end of April and goes through the summer to mid-October. The busy schedule doesn't worry the Whites; they judge as a way to give back. "It's a huge honor for us to be able to do that," Becky said. "We feel like it's giving back to the kids. We both grew up doing rodeo, and it is a way for us to give back to the kids while still doing something we love." Trey has judged NRSA State Finals—in which judges are voted in by contestants—three times, and both Becky and Trey have judged Nebraska Junior High Rodeo Association State Finals. "Being voted on these deals, it's a great honor," Trey said. "It shows all the hard work and time put in through the year is being recognized." The Whites call Paxton, Nebraska, home; Becky works as a nurse in North Platte, and Trey is the kindergarten though 12 art teacher in Paxton. In their spare time, the Whites spend tie working with their horses; they also travel to Becky's family ranch in Harrison or to Trey's folks' in Mullen.